On my list of things to finish this month was Shirley Shrugs -- again. Late last week, I pulled out my cast-off edge and "shortened" it by several rows and bound off again, but a little looser this time. I took it over for a fitting yesterday to determine the most comfortable seam length, then finished that off during the football game. Mom had been having a hard time telling top from bottom. With the addition of short-row shoulders, there's definitely a difference, though it is fairly subtle. I'd shown her the tell-tale "design feature," the double-crossed cable marking the first short-row shoulder, but apparently it isn't as apparent to her as it is to me, or maybe she needs her glasses on in order to see it. 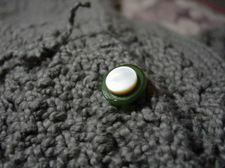 I tied a small bit of yarn on the inside at each shoulder, but that's not so pretty and is still a mostly visual clue, so I also attached a vintage mother-of-pearl & Bakelite button to the inside left. Oh, my, is this ever nice around the shoulders. The short rows worked wonderfully, just as I'd hoped, and I'm excited to finish the knitting and fool around with the closures -- probably from cuff to elbow or just above. 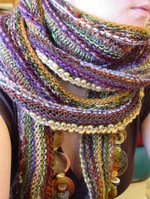 What I've got cooking in my mind's eye -- an optional closure at each end so that it may be worn closed as a shrug or open as a shawl, but without looking "unbuttoned," so that the closures have to be a decorative element, or... this makes me laugh... you might even say an "embellishment." You know, I'm going to have to admit that I've had a few fuzzy thoughts about what I might like to do, but the inspirational clarity comes from one of Fiona's swatches. As found at Mason-Dixon Knitting: I've sent my foot measurements to Cat Bordhi, have you? Still to come: Katie's "new" car. Socktoberfest details. Shirley -- shot on the kitchen floor. If you see any spills or spots or crumbs, please keep it to yourself -- floors are not on my list today. In fact, as soon as I'm finished with a few little things here on the computer, I'm taking the morning to knit. I have the house to myself 'til noon-ish -- that's been a rare occurrence of late -- and I'm taking full advantage to do whatever I please, without guilt. My foot was the handiest (or footiest) thing around for scale -- there's a weird Birkie tan pattern this year due to the new style. ; ) I haven't had a pedicure in a couple of years, though I'd rather like one. Be that as it may, my big, unpolished toe seems to be pointing in the direction of the first short-row shoulder -- can you make it out? And the second? It's basically short rows done to accommodate the deletion of one full diamond repeat at the edge (in this photo, it's the upper edge). It makes a slight curve and a bit of a pucker where the shoulders will be when worn. Neither was done flawlessly, but I rather like the "markers" I left behind. I'm working down the arm -- I could probably have left off one repeat at each end, but Mom does like to roll up her sleeves. ; ) It makes a little more to cuddle into. I perched atop a pergola "bench" to try and capture the color of my favorite ash in the back yard. I just love the soft purpleyellowgreenishness. The color changes have been pretty dramatic over the past few days -- the maple two doors down that can set my bedroom afire on a sunny morning has been lit! The ash will be bare in a few more days -- one of the first to drop its leaves. The walnuts are falling fast in the lower yard, too. I collected them last year, but it turns out I misread the directions about how to store them and I ended up with a mess. I might try it again. The Packers won their first game! My fantasy team didn't do badly either -- I have running backs on both sides of the ball in tonight's game -- should be exciting. Katie's been knitting! She knit some leg-warmers recently and this scarf. The scarf was knit length-wise on a circular needle -- I don't remember what size -- using scrips and scraps from the stash and self-fringing at both ends. She used everything from sock yarn to worsted to bulky, down-home wool to stuff with a little glitz and glam (but no fur, thanks). It's about 20 miles long, as you can see from the number of times it's wrapped around her neck, but she likes to wrap 'em so it's good. She made the button necklace, too, using fishing line and mostly buttons from the nearly full drawer in her great great grandma's sewing machine -- plus a few large coat buttons found at a recent antique stop. There was always a box of Constant Comment Tea in the cupboard when I was growing up. Mom didn't drink much tea, that I remember, but she always had some on-hand. While I certainly don't have "constant comments" around here, I get a few now and then and they sure do add up! I noticed this morning that the number is nearing 6000 and that's a good enough reason for a contest, no? All you have to do is leave a comment and if you're #6000, I will send you a yet-to-be-determined prize. Thanks for the piratey chin-ups yesterday -- I had some good laughs! More than anythin', "yo ho ho" be a good replacement fer th' smokes -- nay poop decks or walkin' planks fer me! Yo ho. The highlight of yesterday is that it was much like the day before. Whew! Hugs, kisses, smiles; sometimes sleepy smiles. I didn't spend too much time, don't want to over-do -- he needs lots of love, but he needs to rest and get better. That's the hope for today, too. We already know that Friday will be much different. Surgery is scheduled for first thing and, yes, it is Michael's birthday and St. Patrick's Day. I'm already thinking of leprechauns, rainbows, pots of gold, slightly more than 16 candles, four-leaf clovers, Aran sweaters, redheads, freckles, green, green, green, and luck o' the mostly honorary Irish (though there is just a splash of real, by-now-very-watered-down Irish in our veins). Kiss someone Irish tomorrow and give 'em an extra peck with a thought for my bro, hm? I'm still knitting blue and there's plenty more in the bag. I keep thinking of what I might take up with next, but that's Shirley Shrugs, resting quietly in full view of me and the closest stash atop the entertainment center. That's Mom's going to demand that it get some attention. Making the loudest stash noise at the moment and making valiant effort at catching my eye (other than at least five -- no six -- varieties of sock yarn that's really getting quite obnoxious), is this nice, green, wool-cotton that I purchased last June at School Products in NYC with a sweater for Mack in mind. It's even already found a pattern with which to associate -- Knitty's Trellis. Running a close second and third are Bamboo and the Juniper baby alpaca, both sent by my BP from last fall, Jessica; she sent me some Hemp yarn, too, but I can't hear it from the hamper. TypePad's home page has a feature section to showcase their user's blogs. Recently, they've featured Ben Roethlisberger's Official Blog where I left comment #250-something, congratulating him and his team on their Super Bowl win. Dork. Not only that, but I was all misty watching Bart Starr deliver the Lombardi Trophy at the award ceremony. I think my favorite commercial was "Addicted to LOST," (that's a video link and may take a while to load) a bit of fun with a great, old Robert Palmer song. Both the National Anthem and half-time show were uninspiring and disappointing; I was most disappointed in the anthem performance. I completed the first short row shoulder over the weekend and I think it turned out great! 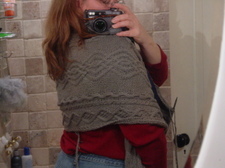 It's very difficult to photograph and I think it's hard to even see it (which is a good thing) -- I can see some blurpy stitches on the row where all the wraps were worked, but it's not bad. It curves! I'm not quite sure how the second shoulder will be worked technically, but I'll be thinking about it as I work my way over there and it'll get figured out. Pics: modeled on Maddy's shoulder (above); right side (left); wrong side (right). See the bend? It's like magic. I do see an extra little twist in the cable at the bottom of that last diamond (the wrap row), but I'm not worrying about it. I was in my PJs, celebrating International Pajama Day, until nearly 5:00 when I packed up Shirley Shrugs (& Her Short Row Shoulder) to go for pizza and football at Mom's. The nice thing now is that I can knit it in her presence. Sometime after half-time, she said, "That a lot of knitting, isn't it? You wouldn't think so, for a shrug." Heh, no ordinary shrug, mum. Katie called Sunday afternoon. She had a busy weekend, visiting Hyde Park (where there are flowers! ), Kensington Palace, St. Paul's Cathedral for evensong, Leighton House. Actually, what she said was, "I went to Lord Leighton's house." I heard it in the same way that she might have said, "I'm going to Jay's house." I said, "Did he invite you in for tea?" ; ) We had a good laugh. 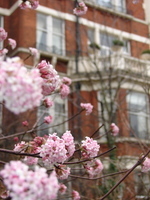 (No, she didn't have tea with Lord Leighton, nor with the Queen in her gallery at Kensington.) ; ) A fellow student from North Africa asked her if she was going to be watching the soccer game... She thought she'd watch a little. Next weekend, Katie will be going to Wales -- horseback riding, even. And in a few weeks, she'll spend a weekend in Peterborough with host parents my sister had during her time studying in England. On the left are two things that led to my vision of turning Shirley Paden's beautiful Cabled Shrug in the Fall '05 Interweave Knits into something just a little bit different. With short row shaping at each shoulder, I'm hoping that it will hug the neck more and be more inclined to stay on the shoulders, but still be very shruggy and very much a shawl. In the mail yesterday was my very own copy of Fall '03 IK -- that must have been the last issue before my subscription began -- I've seen a few other projects from that issue recently that made me decide to nab a copy. 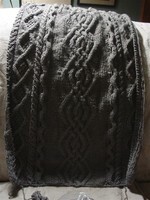 Obviously, "Short Rows" (the sweater) is inspirational in this endeavor, but the thing that really put it in reach was Teva Durham's incredible pairing of "short rows" (the technique) and cables for the Aran Tree Skirt in Melanie Falick's Handknit Holidays. (Short rows also combine nicely with color work in the book for a Floral Tree Skirt). Wouldn't it be Teva Durham? Who else!! Anyway, I'm 10 rows from knowing whether I'm close to being on the right track. I saw my mom last night and she loves it -- loves the color, loves the texture, she even loves the wrong side. (She better not love the wrong side best... I don't know how she could, but that could so happen.) She can't wait to wear it -- and she means sometime in the six weeks left in this winter. I remain true to this project and excitement is mounting at the moment -- so glad that the weekend is nearly upon us. If all goes well, I'll be motivated to get to the other shoulder; after that, I'm afraid I'm going to have to plan some rewards (or something) for the completion of each repeat (or something) down the other (long, long) arm to the finish. The Olympics begin in a week and a day. I feel like I'm at Nationals, and while my programs for each competition are different, there are some similarities. Shirley Shrugs for Nationals: Big, Green, Cables. Williamsro for the Olympics: Big, Green, Cables. My hands are getting used to cotton after a bit of a hiatus; you may recall that Shirley Shrugs was supposed to be a Christmas gift for my mother. Ahem, don't worry, she didn't suffer. I used to like knitting with cotton; these days, not so much. I am persisting and resisting, picking myself up off the ice when I fall, getting back on course when I miss a gate... Oh, the pressure to stay on the sled! As of last night, I've begun the experimental short row shaping at the first shoulder and I'll be nearing the half-way mark soon. I intend to participate in Super International Pajama Day on Super Bowl Sunday (this Sunday) and perhaps I'll meet and pass that half-way mark, meaning that the short row thing doesn't look stupid and I don't waste too much time with that. It would be super if I made it to the other shoulder and started on the long, long, long home stretch. (Did I mention that it's l-o-o-o-o-n-g?) Well, a girl can dream -- and I'll be wearing jammies. Do click on the button. I am going to meet that woman someday -- on her turf or mine or maybe even in Scotland! There will be wine, maybe pajamas -- that would put a different spin on the international part, wouldn't it, Celia? More goodies in the mail! I don't remember if it was the Wellington Hat or the Celtic Braid Socks that I recently "saw" in progress somewhere (probably the socks), I immediately shot off an email to Yellow Dog Knitting, where they just happened to be putting together an order for Cabin Fever. The yarn is stash yarn of varying ripeness. I've got some Galway that I'm thinking of using for the hat, and some gorgeous Lorna's Laces Shepherd Sock in a pewter color for the socks. They love the sock at YDK, too, and mentioned that they're thinking of using it in a class. It's a different type of heel and toe for me, so I'm excited about that. But resisting. I'm in the middle of Nationals, you know. Punxsatawney Phil saw his shadow this morning, meaning six more weeks of winter. First, we need winter to arrive in these parts! I've got a little pansy action going on in my living room year 'round, and I finally found the perfect frame for the vintage pansy print that Cara sent me last year from Maryland Sheep & Wool. I've been shopping and looking for months and here I had the perfect thing right in my own home, practically in the same room. Isn't it sweet? Thanks again, C.
Duncan's got the best seat in the house for admiring the tree! He's been super-feisty lately, terrorizing his fellow pets and tearing around the house with such vim and vigor that some of us have been caught in the crossfire. I was innocently folding laundry on Sunday when Duncan came tearing through the space between me and the basket; his paw landed on my foot and a claw was extended, striking right between two toes (OUCH! and many expletives deleted) as he launched himself through. He actually drew blood -- like I dripped blood on the floor when I went to get a band-aid! He drew blood on Ali at some point, too, though I don't think there was dripping. The girls look like they're playing Ring-Around-the-Christmas-Tree, don't they? Katie's wearing my red cowboy hat -- she looks way better in it than me, but here you go. Yeehaw! 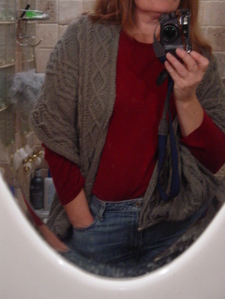 I got all gussied up this morning -- even tied a bandana around my neck -- for a bathroom mirror pic to keep y'all happy. Y'all happy? I hate having my picture taken and it's absolute torture to take one of myself. I must really love you guys. (Don't burst my bubble, okay?) Added later: Oh, for crying out loud, I didn't mean to post a life-size picture. Really, I didn't. Proof that wonders never cease: there are knitting pictures today. There we have Shirley Shrugs with not a bad reprsentation of color -- it's a toughie, a gray-ish, sage-y-ish green. I think I've got one repeat to go before starting the first experimental shaping of the shoulder using short rows, though it seems to be measuring up a little short. It's all experimental. I love that in a Christmas gift for Mom, two and a half weeks from deadline and several days behind, don't you? Man, I love these Log Cabin Socks. I love that yarn, too. Cascade Pastazza -- soft, a little fuzzy. I should be even further but I screwed up yesterday at the change from ribbing to pattern. See how the ribs flow right into the cables? I forgot to move a stitch and I was off by one and didn't realize it 'til I'd already done the second cable. R.i.p. I did the required 12 rows of Shirley Shrugs last night and it wasn't so bad. The little voice says, "Why knit something if you don't love it?" The other little voice says, "It's for your mother; she's done plenty of things for you over the years that she didn't really want to do." That other little voice kind of puts me in my place. I did not pull out the second Log Cabin Sock, but I did work a bit on Weasley. Woo! DH & Maddy brought the Christmas tree up from the basement. I noticed a string of lights marked with bits of masking tape -- must have flagged it last year as needing to be replaced. Heh. That string is glowing brightly, wouldn't you know, but there's a HUGE chunk at the top of the tree and some spots near the bottom that are dark, dark, dark. Ugh. Today, I'm going to learn a little bit about my credit union's online bill pay service. I've paid plenty of bills online before, but never in this way. My most recent bill from MCI came with a notice that they'll start to charge me a fee to send me an invoice unless I register for e-billing. I'm old-fashioned -- I like to hold the actual bill in my hand, to write the actual check, and stick the actual stamp. I've got to get with it. My mother (let's just say not so computer savvy) will be happy to hear it -- she's been doing it for quite a while! Y'all had eyeballs popping out of your heads yesterday at the number of Bloglines (or Fucklines, depending on who you are and maybe the day) subscriptions in my list. You know, I make it a point to subscribe to the feeds of people who make themselves known to me in one way or another -- by linking or commenting or emailing or throwing a dart at my Frappr map. When you click on my list of feeds, all you see is the gigantic list. When I click, I see it with highlights -- you know, 384 subscriptions, but only a fraction of those have new posts, and they're broken down into smaller (but not yet bite-size) pieces. I haven't been using my new system for very long, but I am SO happy with it -- the blog reading is so much more manageable. I've actually been caught up with blogs a couple of times this week! Geez, remember? Back in the day -- a year ago -- when we blindly clicked on our link lists not knowing whether anyone had posted anything new. And the learning curve -- figuring out who was who and who posted when and how often -- Bloglines is SUCH a time-saver that way. I will freely admit that I don't read every single word of every single blog every single time -- just can't do it -- nor do I actually open every single blog every single time, but I'd rather skim them than ignore them altogether. Just last night, I was reading Jen's post about Christmas Stockings and her desire to knit one for X by Christmas. Then I clicked on "Knit Blogs UVWXYZ" and saw a post on Zip-a-dee-doo-dah Day about Christmas stockings -- and a Stocking Along! Did you know there was a Stocking Along? I didn't, and I don't think Jen did. I was so happy to share that with Jen and hopefully she'll find a pattern or maybe just some inspiration and support. That's the kind of stuff I love about blogging and why I like to read and/or skim lots of different blogs. I'm kind of mad -- okay, I'm pissed -- because there are supposed to be pictures in thist post, but the email I sent from home this morning with files attached is still floating 'round cyberspace at this hour. You should be seeing a finished Log Cabin Sock and a little progress on both Shirley Shrugs and Weasley. No need to adjust the dials or clean your glasses, they're just not here. Harumph. I don't love Shirley Shrugs. I should say I don't love the yarn I'm using, but Mom picked it out and I really love how it looks, it's just not fun to work. I'm at the stage where I'm starting to play games -- last night, it was math: how many rows left to do divided by how many days to do them equals at least 12 rows a day. (Coming attractions: What if it was a birthday present (end of January)? Would Ladies' Log Cabin Socks cut the mustard for Christmas? How many days before do-or-die decision time?) Dang, I used to love working with cotton, but I think I've become a wool pig. I've thought of doing it in something else, but darn it, she picked it, so I'm dreaming of doing it again in wool -- for myself. I love Weasley! Worked only a few rows on the second sleeve -- this is my reward knitting. I really want to work on it all the time, at any given time, but must keep nose to Shirley grindstone. I love Bloglines. Sometimes it's techno-crap, too, like when it's HOURS and HOURS between the actual posting and showing up in the list as having posted, but I can usually techno-tolerate it. My name is Vicki and I have a Bloglines subscription addiction -- about which I really have no apologies. There are so many talented, inspiring, creative, and funny people out there, I want them all! And there are new baby blogs born and waiting to be discovered everyday! The problem is that even with eleventy-bazillion-and-six unread posts waiting, I'd still read my "go to" blogs first -- that might be considered clique-y, but there are bloggers with whom, for whatever reason, I feel a connection or a level of comfort or share an interest and/or they post everyday -- WHATEVER -- but there'd still be a LOT of unread posts at the end of the day. Several weeks ago, I divided my subscriptions into three different folders -- one for blog-related stuff, one for knitting blogs, and one for mostly not knitting (aka, general interest). That didn't really help, since 99.99999% of the blogs I read are knitting blogs. I did make a separate folder, then, for bloggers I've met and that helped a little bit. I remembered a short-lived experiment with reading blogs in alphabetical order, kind of, by day of the week. A-E on Monday, F-J on Tuesday, etc. 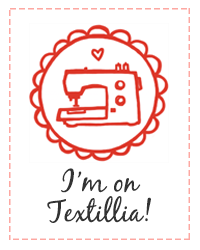 That didn't really work very well, either, but I thought I'd apply it to my knit blog list and I like it! I really like it!!! I blew away several thousand unread posts in order to do it, and I haven't gone on vacation or anything like that, but I feel like I'm keeping in the loop a little better, even with folks who post infrequently. For the most part, I don't even click to expand those folders, just click on the folder heading and read with a "come what may" attitude. My ever-changing, always growing (there's that addiction thing) list is always available from the right sidebar under "Blog Links" or click on the link above. When Maddy was born, knowing she'd be my last and with Katie in first grade and Ali in preschool, I decided to be a full time mom. I figured it was a now-or-never. I had put in a full day working and/or going to school since I was 14, so coming to a full stop and making such a big change at age 33 meant there was a period of adjustment. Y'all know that I love my children to pieces and I wish they hadn't grown up so fast, and yet there were times when they were little that I wondered what kind of nightmare prison sentence I'd signed up for! Would I ever have a minute to myself again? Would I ever get enough sleep? An uninterrupted conversation with another adult? One of the things I did for my sanity during this adjustment to my new life (one that I did eventually get used to and enjoy for five years) was join the "Hobby & Craft Club" -- a group of women that met every Thursday morning for two hours in the community room at City Hall. Secretly, and among friends, I called it "The Old Lady Club" because that's what they all were! I could easily have been the granddaughter of any one of them, and perhaps even the great-granddaughter of a few. Those ladies did a lot of crafting for charity -- church and hospital and nursing home craft sales -- and they worked a LOT of plastic canvas! It's easy on the eyes, you know -- big holes, big needles, big yarn! And it was both quick and cheap. Praying hands, American flags, and crosses were all favorite designs, prolifically produced, all with magnets so they could hold up the grocery list on the 'fridge. 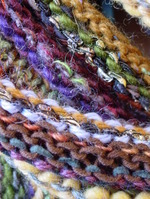 Another favorite was crochet afghans in scorch-the-eyes color combos and big, BIG hooks. I listened to the little old ladies talk (and gossip) and laugh while I worked my counted cross-stitch samplers on 32-count linen -- in extremely poor light. I think they looked on me like a little pet -- they weren't quite sure what to do with me, but I behaved and didn't make a mess, so was tolerated and even humored now and then. It was two hours every week that I could put my head down and work, uninterrupted and without any pressure from anyone about anything (and no phone), and it sure did help. There are some new, or soon-to-be-new moms out there -- Stephanie, Jen, Kate, my little sister. ; ) It's the most wonderful thing in the world, but it's a huge shift in your life and priorities -- no matter how much you read and prepare and think about it or how much advice you get, you can just never plan for all the ways it will affect you. So, in the realm of advice that may or may not help: I never felt too guilty about sitting down to stitch while the kids napped, either. (Or taking a nap while they did and staying up after their bedtime to stitch.) Sanity or a clean house? It wasn't a tough decision (I knew I'd have regular cleaning jags to take care of the dust bunnies). The Number 1 thing is: take care of you so you can take care of your family. It might take some time and experimentation to find what works best for you, but that's okay, too. 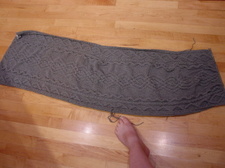 Here's a wide view of my chart for Shirley Shrugs. I forgot to flip the pic -- Row 1 is at the right, the middle is indicated by an orange-ish line, and the shaded triangles are where the short-row shaping will occur to make "shoulders" and hopefully keep the shrug more snug around the neck. I am fully prepared to be making lots of fudge when I get to those areas... I really only need a small fraction of that chart, but I don't see my love for copy & paste ever diminishing (and you get a nice overview this way, too). Have a great weekend everyone! I think we're going to my brother's for lunch tomorrow. I definitely feel like I'm getting better an kitchenering. As with most repetitive tasks, if I can find the groove -- the pattern and cadence -- I could probably do it all day! Oh, I'm so happy with these socks and I can't wait to get 'em off in the mail. Thanks, Mim, for a great pattern (link on her sidebar, along with other great patterns to try! ); I'll definitely be making more of these! So, I think I've responded to all the birthday emails and comments -- if I missed one, it's not because I didn't appreciate your good wishes! Thank you!! There's a comment conundrum 'round here. I love 'em, I even turn on the red light occasionally, but I'm not always very good about responding. Time shortage, more than anything; choices have to be made, something falls by the wayside. Poo. I've heard of people getting paid to blog -- it's Big Business! -- but don't think I've ever heard of anyone getting paid to blog about knitting. I'm first in that line, okay? I had a wonderful assortment of birthday cards -- nearly half had picture of old ladies on them. Norma sent the one with the "coven," along with some witch's brew and that adorable pepper shaker. She's got me pegged! I love it! It's already found a home among the treasures. So, on Sunday, I started off by baking my own birthday cake. I followed that up by starting a big pot of Knitche's Chili All Day! It's chili weather!! The big finale was a double-batch of chocolate chips cookies -- some to take to work as my birthday treat, some for Ali to give to a friend that shares my birthday, some to take to Mom's with the chili and cake. I didn't spend much of that day in my PJs because I was out of cumin... One of my sisters didn't think it was right that I was doing all that work on my birthday. The thing is, I like to cook, but haven't done much lately and to take nearly a whole day and just whoop it up in the kitchen was really nice! I'm going to do that more. One more pic... Ali gave me the 2006 Knitting calendar, and I bought Handknit Holidays for myself from Knitpicks at what I thought was a very good price. I saw this book at Cara's last month and decided that I had to have it. I spent a good deal of time with Excel over the weekend, charting the shrug. My jumping off point, as you may have gathered, was Shirley Paden's Cabled Shrug in the Winter 2005 issue of Interweave Knits. I kept her edge designs, but replaced both the zig-zag/bobble pattern and the center design that it flanked. The new center is a triple-diamond repeat that I saw on a pillow in a magazine and then hunted down in a Barbara Walker book. The zig-zag is replaced with a snaking cable from a Harmony book -- I didn't want any bobbles. At some point over the weekend, I did a google search for Shirley Paden (and maybe the shrug) and came across a blog (neglected to note the name) that commented on the appeal of this shrug, but likely frustration when it came to the actual wearing and trying to keep the thing on your shoulders. I'd always imagined myself (because I'd kinda like one of my own after Mom's is finished) all snuggled up in my chair, wrapped in a big, cabley, snuggly hug of a shrug, but undoubtedly I'm going to need to run and answer the phone/door or want to make a sandwich... get out of my chair. I concluded that perhaps some minimal shaping at each shoulder would help -- some short-row kind of magic that would make a bit of a curve around the neck-ish. This is where the arrival of Handknit Holidays in my mailbox is somewhat serendipitous because there is a cabled tree skirt that uses short rows to make it curve around the tree trunk-ish. Yeah! So, I've fiddled more with the Excel file, a calculator, printed pattern pages, a pencil and a legal pad, and now I'm ready to cast on "Shirley Shrugs" -- an experimental shrug that I'm knitting for my Mom for Christmas!! Heeeee! If a woman is talking, driving home the point she's trying to make that security and safety are the top concerns regarding a particular scheme -- and "driving home" needs to be done because the attitude seems somewhat cavalier ("Beverly Hillbillies" comes to mind) and it doesn't seem like she's being heard -- and she is accused of yammering and it turns out that her concerns are MORE than valid, is it still yammering? Can one say to her, "You were yammering, but you were right." Meanwhile, I had a pretty good birthday. I had lovely flowers, phone calls, cards and a couple of presents; I had lots of cyber wishes and I took your advice and ate plenty of dark chocolate-frosted dark chocolate cake and bittersweet chocolate chips cookies. I spent a lot of time in my PJs -- there will be PJ talk tomorrow. There was very, very little knitting (lots of cooking, instead!). I learned that I cannot cast on a baby sock and pay attention to a movie -- I finally got it, though, and am making progress. I think I'm going to send the single, finished sock to Mack -- I'm a little concerned about length. If it's good, I'll send the second as soon as it's finished; if it's too short, he can send it back and I'll tear out the toe and lengthen it. Oh, and I made HUGE progress with "Shirley Shrugs" -- my pet name for the modifications I'm making to Shirley Paden's yummy shrug pattern. Oh, lots to tell about that, too.